Dhahran — Saudi Aramco Expatriate Schools (SAES) kicked off its 75th anniversary celebration at a ceremony to express appreciation to educators, cementing its core values of excellence, diversity, community, and service. More than 500 teachers, school administrators, and company executives from Dhahran, Ras Tanura, ‘Udhailiyah, and Abqaiq received a red carpet welcome from cheering students at Dhahran Hills School on Sunday. The celebration included interactive school exhibits, displays of photos, historical SAES facts, and large pieces of artwork created by school communities. The exhibit will be featured at each SAES community as part of a yearlong celebration. The SAES Brass Quintet, and “The Shifty Sands Barbershop Quartet” sang at three performances to entertain the teachers. The quartet sang the Dhahran Pledge Song and the Mighty Wildcats Medley, specially arranged and written for the Dhahran school. Student created 75th anniversary logos decorated the entire Dhahran Hills School campus. of the district and its students, something that is critical to students’ experiences and learning. “SAES started in 1944 with one teacher, Sam Whipple, from California teaching one student. By 2015, SAES’ enrollment was at an all-time high of 4,376 students,” said Abdulaziz M. Al-Judaimi, Saudi Aramco vice president of Downstream, who spoke at the ceremony on behalf of president and CEO Amin Nasser. “This progress is nothing short of a great accomplishment,” Al-Judaimi told the audience. SAES current enrollment is over 4,000 students from 70 nations, including the newly opened daycare center. “Aramco Expatriate Schools started with one child — an American boy. Seventy-five years later, we have children — both boys and girls — from 70 nationalities. That’s diversity,” Al-Judaimi said. 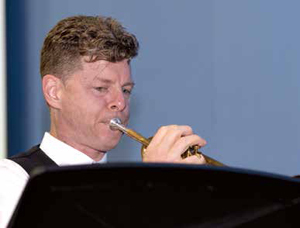 Brian White belts out a note as a member of the SAES Brass Quintet as part of Sunday’s SAES 75th Anniversary celebration. Also performing was “The Shifty Sands Barbershop Quartet,” which sang at three performances. The group sang the Dhahran Pledge Song and the Mighty Wildcats Medley, specially arranged and written for the Dhahran school. Drawing on the schools’ history of growth and diversity, Al-Judaimi also pointed out how impactful teachers could be to their students. He recalled his fondest memories of his elementary school years, about his history teacher (Mr. Hasan) turning history into an interesting storybook, and about taking his mother to adult literacy class. “Aramcons come to ‘Udhailiyah, Abqaiq, Dhahran, and Ras Tanura with the hope and expectation that their children will flourish. We provide a place where that flourishing happens,” said Mike Smith, SAES superintendent. 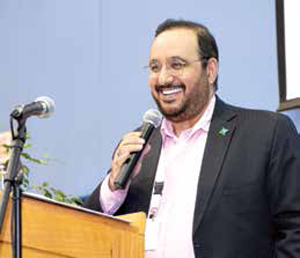 "Aramco Expatriate Schools started with one child — an American boy. Seventy-five years later, we have children — both boys and girls — from 70 nationalities. That’s diversity." Smith said SAES has always sought innovative ways to help students excel, not only on important standardized tests, but also thrive in their overall growth and development as humans. SAES sees its future success in preparing children for their own future. “To realize our maximum potential, we need to fully empower teachers to collaborate, to make the very best decisions about student learning. Decisions that lead to practices that help each child’s individual experience be as rich and unique as possible,” Smith said. As a key part of the daylong celebration, teachers participated in two group activities — focusing on dispositions and design thinking. As SAES looks to its future, and has been charged with expanding their foundational documents to include not only what they do but how they do it. Aramco School educators continue to look toward innovation and creativity implementing the design thinking discipline.